SportsBetting.ag is one of our favorite sportsbooks for American bettors. They offer a lucrative first deposit bonus of up to $1000 and also offer bonuses on all reload deposits, which is rare among online betting sites. They also offer risk free bets to try out all the different sections of their sportsbook including a free in-play bet, a free live bet and a free horse racing wager. After collecting all of the bonus dollars and free plays you will be starting off with a very solid bankroll at SportsBetting.ag. 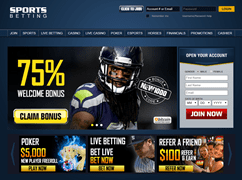 SportsBetting.ag is a safe, secure and popular sportsbook that accepts players from around the world. The sportsbook is extremely easy to use and navigating to the bet you want to place is quick and easy. They also offer a unique esports betting platform, which shows they are staying ahead of the game when it comes to innovation in the sports betting space. I feel very confident recommending SportsBetting.ag to new players and consider them one of the very best options for Americans. SportsBetting.ag welcomes new players to the site with a sign up bonus equal to 50% of your first deposit, up to a maximum of $1000. Use promo code ‘SB1000’ in the cashier to claim and the bonus funds will immediately be added to your account after your deposit. There is a 15x rollover requirement associated with this bonus, which means you must wager through the deposit + bonus amount 15 times before it is truly considered yours. No withdrawals can be made within 30 days of claiming this bonus. SportsBetting.ag accepts bitcoin and they are getting the word out by offering a 50% matching bonus of up to $500 on your first bitcoin deposit at the site. Use promo code ‘BETCRYPTO’ in the cashier when making your bitcoin deposit to claim this bonus. There is a 14x rollover requirement associated with this promotion and as usual no withdrawals within 30 days of claiming. SportsBetting.ag wants you to try out their cutting edge Live In-Game betting platform and to entice players to place some live bets they are offering a $25 risk free in-play bet to all players. If your first live bet loses you will receive a free play equal to your bet up to a maximum of $25. To claim your free play you must send an email to freeplay@sportsbetting.ag with the subject line “$25 Live free bet”, your account number and the ticket number of the losing live wager. SportsBetting.ag is offering a similar incentive to try out their mobile betting platform. The first bet you place via a mobile device is eligible for a refund up to $50 (in the form of a free-play) if your first mobile wager loses. Email freeplay@sportsbetting.ag to claim your bet, including your account number, the ticket number of the losing mobile wager and the subject line “$50 Mobile Free Play”. Like the in-play and mobile betting offers, SportsBetting.ag is also offering a risk free bet for your first wager on the horses. If your first horse racing wager loses you are entitled to a free play refund up to $25. Email freeplay@sportsbetting.ag including your account number, ticket number of wager and the subject line “$25 Horse Free Play” to claim your free bet money. SportsBetting.ag also offers 7% daily rebates on all horse racing wagers placed at the racebook. SportsBetting.ag offers all of the popular betting options that the vast majority of online bettors will be looking for. They don’t go quite as deep into the less popular sports or lower level leagues as some other online betting sites, but they offer all of the bets more than 99% of customers will be looking to place including in depth bet offerings for baseball, basketball, football, hockey, soccer, tennis and MMA. SportsBetting.ag also has a dedicated eSports section of the site, with a state of the art betting platform of esports wagers. I would argue that SportsBetting.ag is the best place online for esports betting. The racebook also offers bets on all of the top racetracks from around the world including a large number of tracks in the USA and Canada. SportsBetting.ag is a comprehensive gambling site and this shows through with their poker and casino offerings. The poker room is part of the Chico Network, which is smaller than some of the bigger poker sites online, but if you’re looking for cash games, sit’n’go’s or smaller multi-table tournaments SportsBetting.ag is great. The Casino also offers everything you could want with all of the best casino games, as well as video poker and slots. There is also a live casino section if you prefer to feel like you’re actually at the casino. The poker room offers a 100% matching bonus up to $2500 for new players. The casino offers a variety of bonuses for new players (up to $1000 each), as well as additional 100% reload bonuses for slots or video poker, and a 20% monthly casino rebate. 24 hour live chat, email (cs@sportsbetting.ag), telephone (1-888-843-9027).